Narratives of Recovery from Mental Illness presents research that challenges the prevailing view that recovery from 'mental illness' must take place within the boundaries of traditional mental health services. While Watts and Higgins accept that medical treatment may be a vital start to some people's recovery, they argue that mental health problems can also be resolved through everyday social interactions, and through peer and community support. 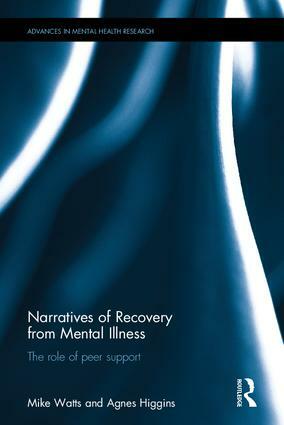 Using a narrative approach, this book presents detailed recovery stories of 26 people who received various diagnoses of 'mental illness' and were involved in a mutual help group known as 'GROW'. Drawing on an in-depth analysis of each story, chapters offer new understandings of the journey into mental distress and a progressive entrapment through a combination of events, feelings, thoughts and relationships. The book also discusses the process of ongoing personal liberation and healing which assists recovery, and suggests that friendship, social involvement, compassion, and nurturing processes of change all play key factors in improved mental well-being. Mike Watts was, for many years the National Program Coordinator for GROW in Ireland. Based in Kilkenny he is currently involved in recovery research and works with diverse groups of service users, family members, mental health professionals, students and policy makers as part of a national endeavour to create a recovery oriented mental health service. Agnes Higgins has worked in the area of mental health practice and education for over thirty years and is currently is Professor in Mental Health at the School of Nursing and Midwifery, Trinity College Dublin, Ireland. She is involved in a number of research projects that are advancing understanding of the recovery experiences of people who experience mental health problems, as well as providing templates of collaborative and empowering research methods.